The Feast of the Presentation of Our Lord is celebrated 40 days after Christmas. This feast celebrates Simeon’s revelation of Jesus as the Messiah, God’s Anointed One, and Anna’s grateful heart giving thanks to God and speaking about the child to all who were awaiting the redemption. On Feb. 2, 1963, 74 of us professed our vows. We arrived at Mount Carmel on July 31, 1960, from 16 states. We came by car, train, plane, and boat. As was written in VISTA December 1960, “However diversified their background they all had one purpose in mind: to consecrate their lives to God as Sisters of Charity of the Blessed Virgin Mary.” With great trust and a touch of fear, we professed our vows on Feb. 2, 1963, and we were ready “to go on steady and quiet,” inspired and motivated by the vision and courage of Mary, the Mother of God and of Mary Frances Clarke. Some years ago I took sentences from the letters of Mother Clarke and wrote the following. On this feast day, I invite you to slow down and allow these words to speak to your heart. 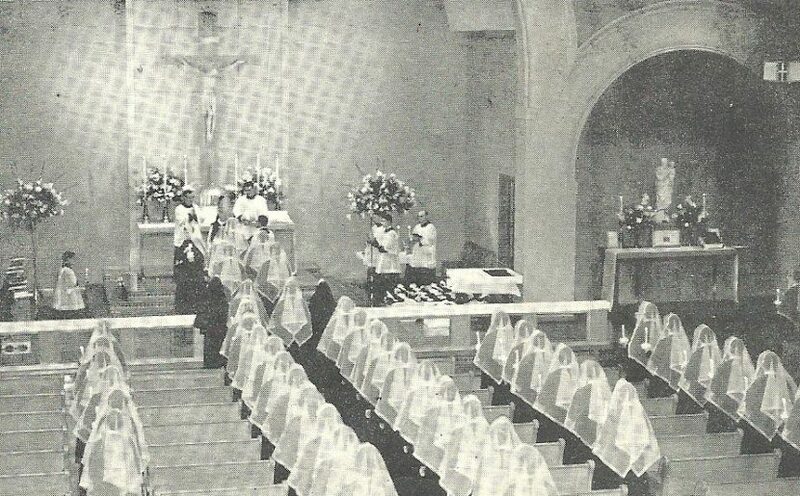 Featured image: Postulants receiving ‘the holy habit of religion and the charity of the congregation’, Feb. 2, 1963. 100 strong and were taken under the capable wings of Sister Mary Leo in the Noviciet and Sister Anna Michael in the Postulate. Many of us left in the 70’s when so many changes in the church were happening. I’m grateful for all I received as a Sister of Charity. It contributed to the woman I am today. I remember those days as I entered in 1959. Have received blessings from the sisters ever since, even after leaving the congregation in 1963 and becoming an Associate a few years ago. Lovely reflection and many blessings to all of you who celebrate your day together. OH HOW I STILL REMEMBER THOSE MT CARMEL DAYS, AND THAT FOTO THAT IS POSTED HERE. THANKS DEEDEE.